Storing bulk foods in PETE bottles using oxygen absorbers. Bulk storage of dried grain, powders, and dehydrated foods is not to be taken lightly. Our government suggests that we do it, foreign governments suggest that it be done. Shall we stick our heads in the sand, No! So let;s get started. It does not take a lot of money to save a little food in case of an emergency, power outage, snow storm, or simply to give as a gift to others. Take any soda, fruit juice, or my personal favorite Gatoraid. Just make sure that is has a number one on the bottom to indicate that it is a food grade plastic called PETE. Wash the bottles with soap and water, allow to air dry. An alternative would be to rinse the inside of the bottle using a water solution with one teaspoon of Chlorine bleach to one gallon of water. Make sure to wipe the threads of the bottle and cap with the same solution before drying. 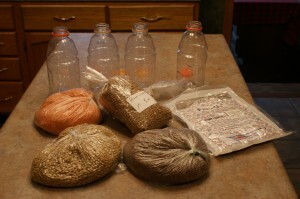 Assemble our dry goods, bottles and oxygen absorbers. Now that we have our containers, what shall we package? A sample list is provided below. Milled Grain Products : White Flour, Degermed Corn Meal, and Rice Flour. Oily or Moist Grains and Milled Grain Products : Brown Rice, Whole Grain Flours and Cereals, Granola etc. Products containing leavening : Cake/pancake mixes, Biscuit mixes, etc. In the grocery stores these products are package in breathable packages that allow the gas produced by the leavenings to escape. Place a 300 cc oxygen absorber into the bottom of the bottle, we want the absorber to pull any oxygen from the contents of the bottle. If we place it on the top of the contents it is possible that the absorber will pull oxygen through the cap and break our air tight seal. Place 300cc oxygen absorber into the bottle. 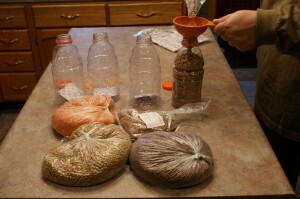 Start to fill the bottle with our food we want to store. If you do not have a funnel, cut the top off of an old two or three liter bottle of pop, wash it, and then flip it upside down placing the threaded end into the bottle to be filled. 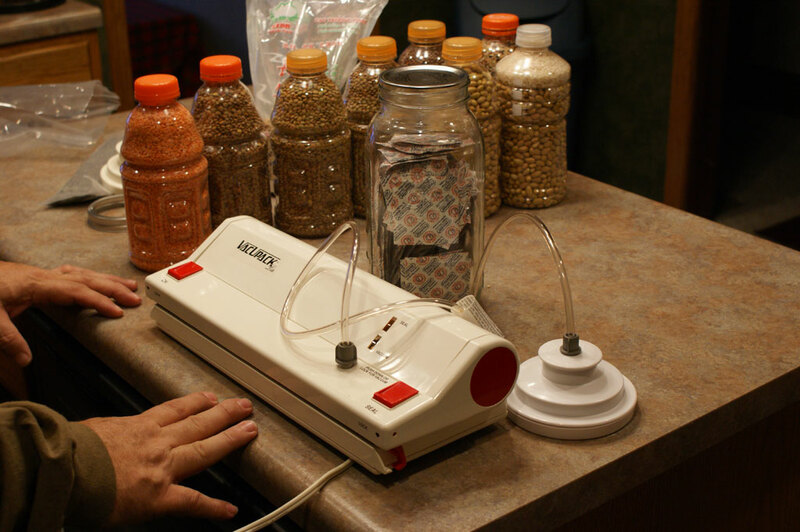 This makes a very cheap funnel and you can have several sizes if you like. 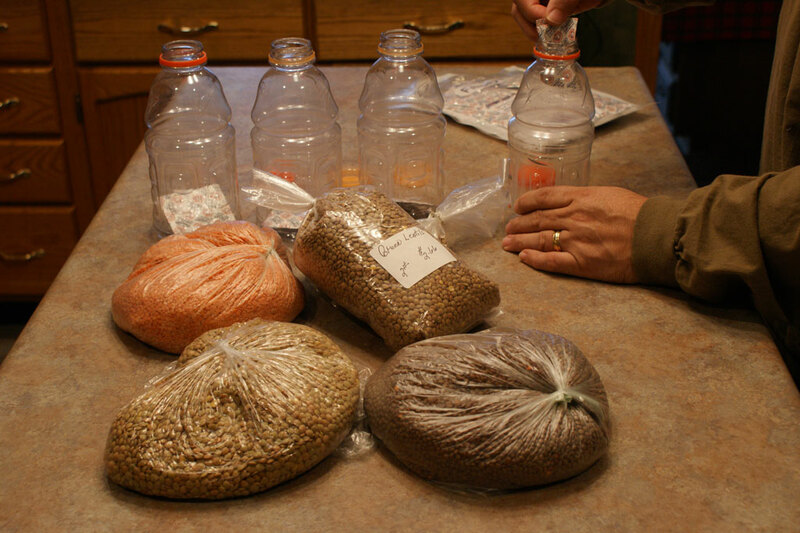 Fill the storage bottle right up to the neck, we do not want to waste space, then cap the bottle immediately. Make sure to tap the contents several times during the filling to help settle the contents, this will also allow us to hold the maximum amount in the bottle. Place the cap on and firmly tighten. I also placed black electrical tape around the cap, I did this for several reasons. The first is to add a simple reminder that the caps should not be removed, the second is to prevent the caps from loosening on their own from being moved or bumped. Fill one bottle or several bottles, it is up to you. We need to make sure that the remaining oxygen absorbers are safely stored until the next time we need them. Vacuum the air out of the jar of oxygen absorbers. I used our vacuum sealer to store them in a glass bottle, then vacuuming the bottle to remove any oxygen. This should allow me to keep them for up to six months. An alternative would be to place them into a sealable bag and vacuum bagging them in accordance with the manufacturers instructions. I chose the glass jar option, people in earthquake prone areas should lean toward the vacuum bag. Filled bottles with taped caps. 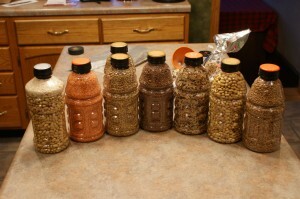 Store you bottles in a cardboard box where they are cool dry and in the dark. The back of a closet or a basement is a good choice as long as it is dry. Many items are not light stable, so they will degrade if stored in the light. Our next installment will look at how we can use this base post to build individual meals in the bottles for quick use, backpacking, and gifts.